Play the clip to students, then hand out a comprehension sheet and play it again (I find I have to let them watch first without having 30 pieces of paper flapping in people’s hands). The language is really simple and has handy subtitles so you could easily adapt your questions to suit any ability. What vegetable are they carving into a lantern? What are they carving the pumpkin into? What do they put inside the pumpkin? What does fancy dress mean? What is the boy dressing up as? What is the girl dressing up as? What time do they get changed into their outfits? What other outfits can you see at the party? What fruit did they play games with? Who comes to the door? What do the trick or treaters say? What do they give the trick or treaters? Depending on the level of the class you could choose to use multiple choice questions, open questions or a mixture of both. With lower ability classes I often go through the video and pause it at specific points to give the students a chance to read the subtitles fully. If you make sure that your questions run in chronological order you can pause the video as each answer crops up to make it even less challenging. A further activity that you can do for advanced students with any video comprehension lesson is to have them write their own questions for a partner – students love to play teacher every now and then! 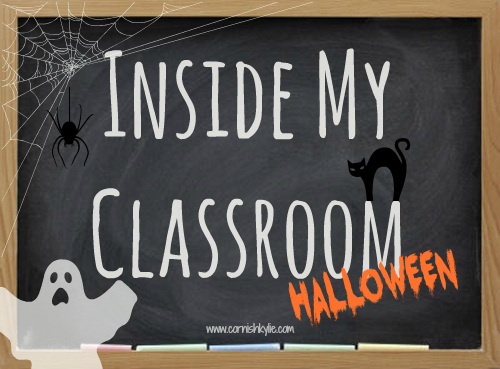 With Halloween just around the corner why not incorporate some spookiness into your lessons? Take a trip with a young boy to the museum to look at the dinosaurs where things aren’t quite right. What happens next..? Venture inside a spooky cave, what will you find inside? As the videos have no spoken language in them they can act as inspiration for all abilities and incorporating any vocabulary or writing techniques that you have been teaching. None of them are overly scary, most of the spookiness is up to your imagination, so they are fine to use with younger children. Students can be shown a film and create a story board, rewrite what they saw, predict what happens next or make an alternative ending.